As social justice controversies fragment the increasingly economically precarious populace, a financial aristocracy has arisen that rules the nation behind the screens of “meritocracy” and “equal rights.” No one is more in favor of equal rights and the abolition of social privilege that the members of the financial aristocracy, who have no need for social privilege since they control the real source of power in America: proximity to credit and newly issued money. While social justice proponents focus on divisive distractions, the financial aristocracy is tightening its control of the nation’s economy and political order.As everyday life, civil liberties and economic security all become increasingly precarious for the bottom 90%, the divisive focus on social privilege becomes a useful distraction for the financial aristocracy, which also controls the mainstream media. America’s aristocracy is chuckling with great amusement as society is torn to pieces by media-circus sideshows. America’s aristocracy doesn’t need any titles or overt class distinctions as the aristocracy of old had; this would only call attention to their dominance. The ideal arrangement is a society shredded by social-media-driven fabricated divisions and a profound apathy to the actual structures of power, wealth and control. America’s aristocracy is not formalized, and that’s the secret of its success.The power and control are exercised behind the formal machinery of governance and finance, and this structure protects the aristocracy from scrutiny. 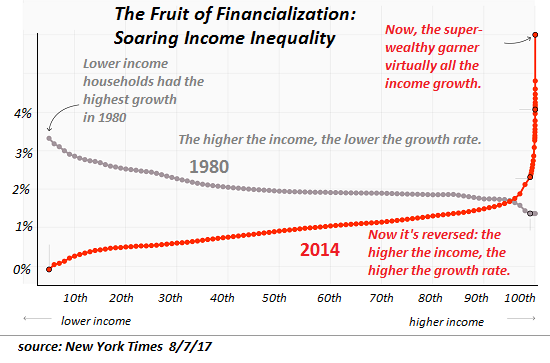 So by all means demand Medicare for All and UBI: the aristocracy is heavily promoting these expansions of its wealth and power. Just as the Roman elites favored distributing free bread to the disenfranchised masses and the staging of Netflix binge TV watching–oops, I mean circuses– so too does America’s aristocracy favor UBI, Medicare for All and a fragmented society in thrall to disunity. This entry was posted in General and tagged financial Aristocracy, social justice. Bookmark the permalink.